southern orders : THE BENEDICTINES AT COLLEGEVILLE, MN, WHAT WERE THEY THINKING? 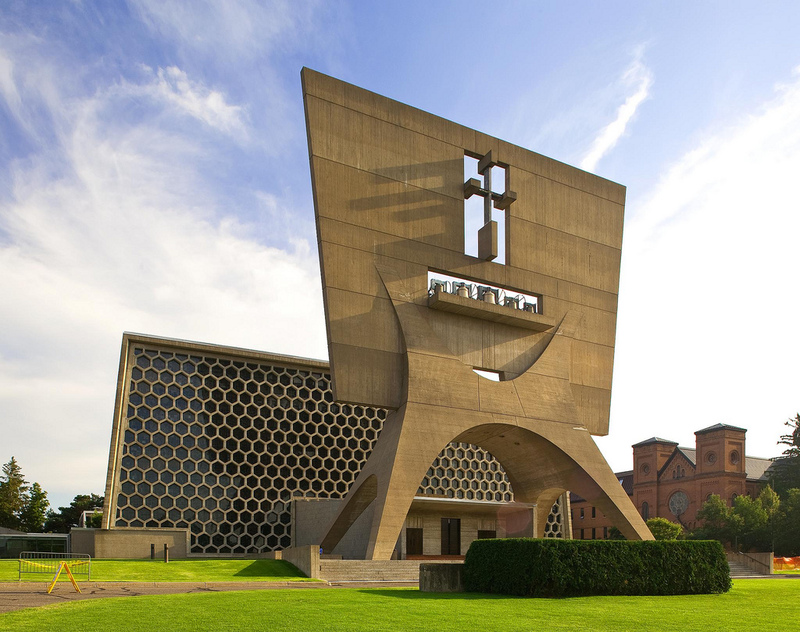 THE BENEDICTINES AT COLLEGEVILLE, MN, WHAT WERE THEY THINKING? Okay, I have a confession. 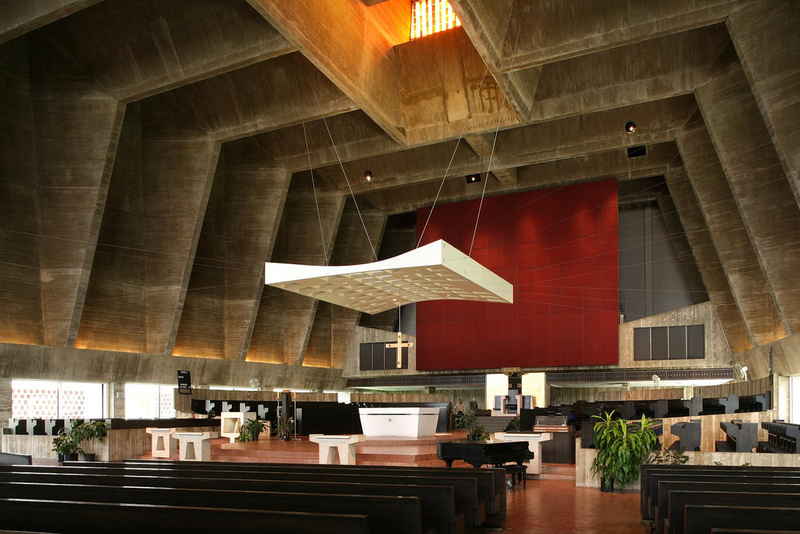 There are some examples of modern church architecture that I actually like. 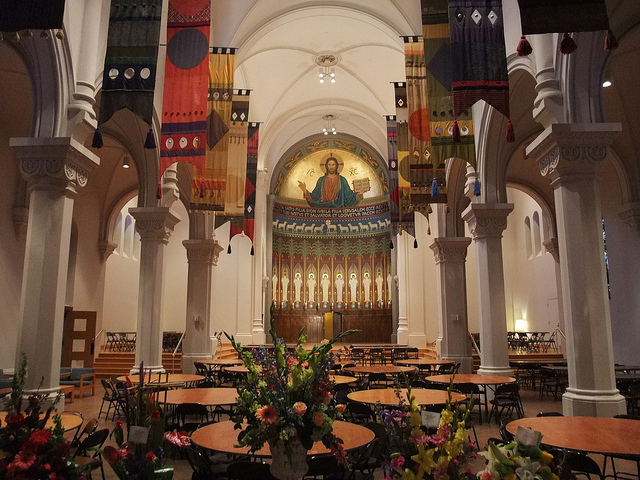 Two examples are in California, the cathedral in San Francisco and in Oakland. This, however, I do not like and it leaves you scratching your head that Benedictines would build such a monstrosity although I know it can be called artistic. I won't dispute that. But look first at their original abbey Church, St. John's and what they did to it after they moved into their new and improved one in the 1960's post-Vatican II. 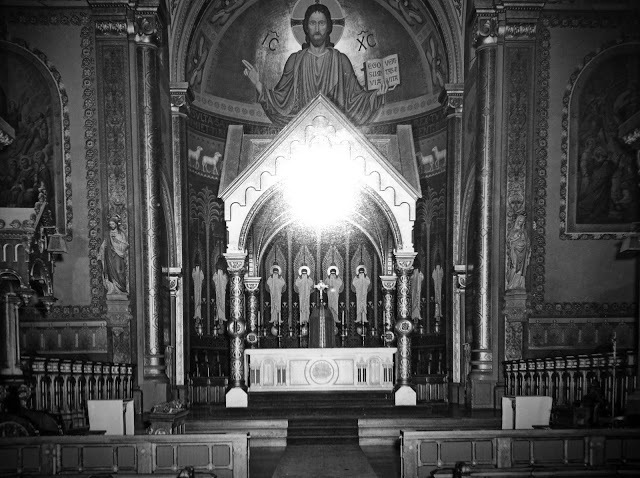 Keep in mind, that the Benedictines of Collegeville did more than any other Benedictines to promote liturgical renewal in the USA but a particular kind of liturgical renewal that we have yet to fully recover from. Now for the new and improved. Please note in some of the photos where the "Presider's Chair" is located and how many steps higher it is than anything else in the abbey church. Thus the presider can pompously sit while everyone else does something, but make no mistake, the focus is on him. The placement of the presider's chair still fascinates me, that it of all things would be elevated so high and dead center. Whereas in the original abbey church, the altar is accorded such status. Is this narcissism on steroids, a peculiar common disease of liturgists? The new place is downright scary looking on the outside, kind of like the entrance to the underground caves to visit the Morlochs in the 1960s movie, The Time Machine. A cathedral to man. Someone recently commented that the priest can sit there like Caesar - perhaps he can also give thumbs up/down as his subjects battle the Novus Ordo below. I'am stunned at how ugly and uninviting this space is particularly with all that bare masonry. If this is someone's idea of a foretaste of heaven, it's no wonder people have stopped going to church. I wonder what some of the monks at the time must have thought about the new abbey church and leaving such a splendid older one and then stripping it bare. The interior of the bee-hive looks like it is a place to worship pi, instead of Christ. I wonder if they offer 3.14 sacraments. It looks like tha sacristy was inspired by Salvador Dali and the exterior by a creamery paddle. Maybe it's red to remind folks of the path to hell is paved with good intentions. I am sure it wasn't the architect's intent, but it is one interpretation! If you Google images of the Abbey chapel you'll discover that different pix show the floor in a variety of colors and hues. Some are rather brown, some a reddish-brown, some a brownish-red. Only a couple I saw show that "candy apple" color. I haven't been there, so I don't know what the true color is. This one is even light brown. "But look first at their original abbey Church, St. John's and what they did to it after they moved into their new and improved one in the 1960's post-Vatican II." 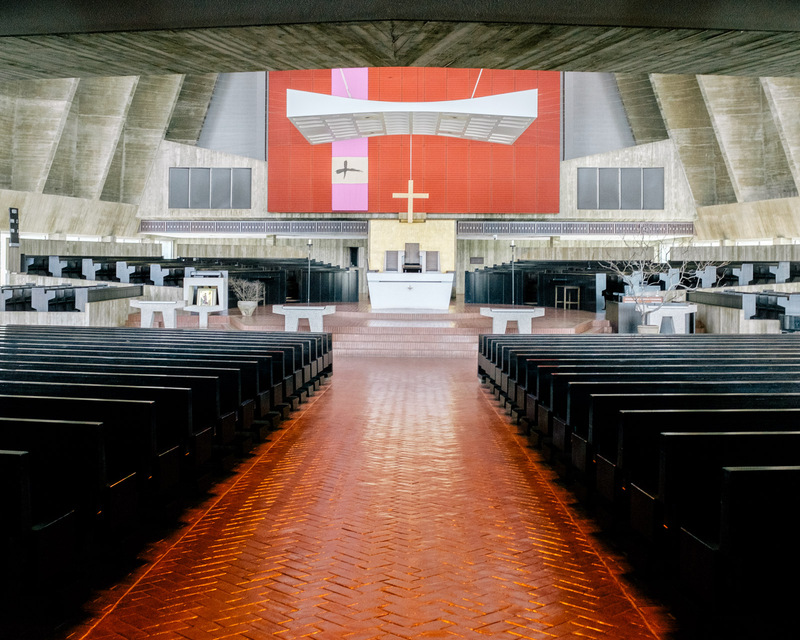 The new abbey church was conceived by the abbot in the early 1950's, the project was begun in 1953, and the church was completed in 1961. Vatican Two began in 1962. Are you saying that the presiding chair elevated to the heavens is pre-Vatican II triumphalism? 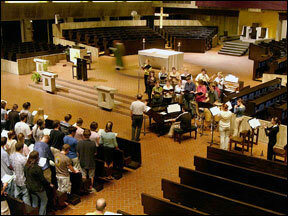 No one knelt for Holt Communion when it was completed and Mass faced the congregation? I'm saying that your description of the Abbey church as one, "...they moved into their new and improved one in the 1960's post-Vatican II." is wrong. 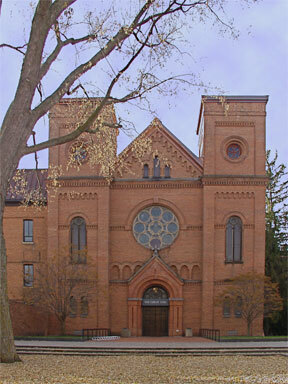 The Abbey church opened in 1961. The Second Vatican Council did not open until 1962. Oh, TJM at March 22, 2019 at 9:05 AM: You gave me the opening....! Well there were awful churches being built in the 1950s like Le Corbusier's "mess-terpiece," Notre Dame du Haut, which looked like a big mushroom. The floor is not "red inlaid faux brick flooring." The floor is real brick. I like the floor of the new church, it might have even looked nice in the old church. As for the rest of the new church, it looks hideous. It is a blatant and possibly successful attempt to make Catholicism look stupid. Iconoclasm? It may be real brick but it doesn't change my impression. Some of the effect is how the lighting plays off of the brick. Not good. And you are aware that in many places today, there are walkways, common areas and crosswalks of inlaid brick. I live in a city where some of the older streets are still brick to this day. At the time this church was built it may have been novel but everything new is not necessarily good. Let's give God the best and leave the brick to the exterior. The whole building looks like outdoor unfinished infrastructure! It looks like an outdoor church set up under a highway bridge! The collegeville crowd would do well to turn the new church into a meeting hall and cafeteria and restore completely the old abbey church. 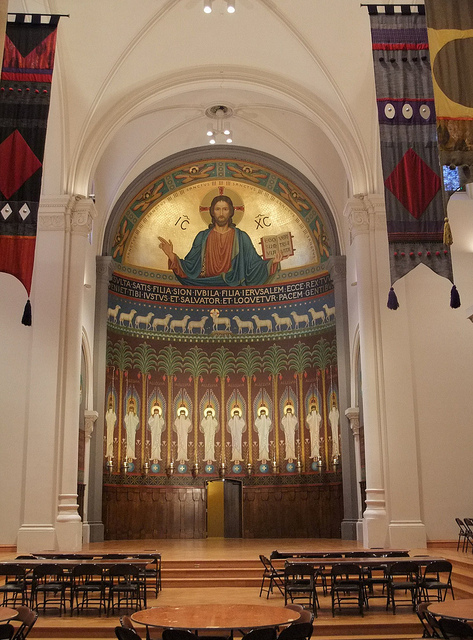 An example of how brick can be used to good effect on the interior of a church is the Basilica of Saint Lawrence in Asheville North Carolina. I assume the old abbey church seated less people than the new one. Since vocations have plummeted there, your solution makes a lot of sense.